In this article , you will learn how to deal with the refresh token when you use jwt (JSON Web Token) as your access_token. Many people choose jwt as their access_token when the client sends a request to the Resource Server. 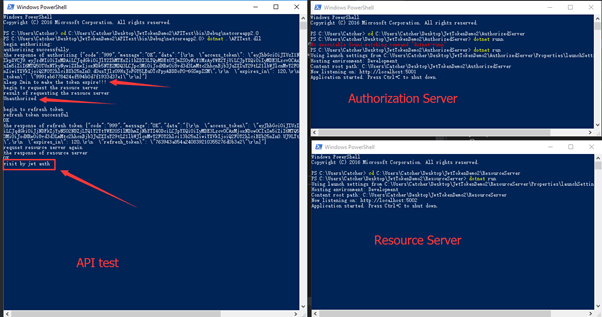 However, before the client sends a request to the Resource Server, the client needs to get the access_token from the Authorization Server. 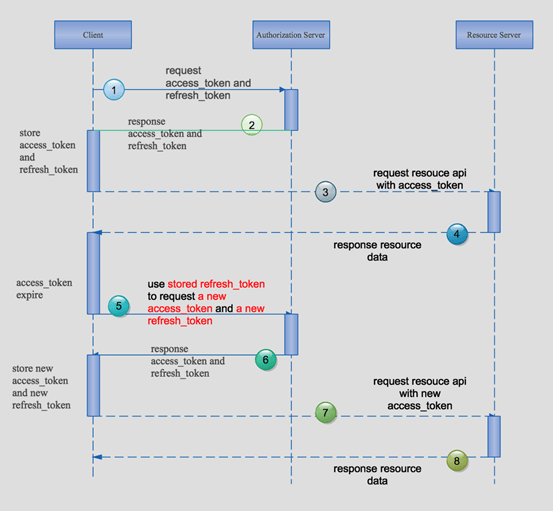 After receiving and storing the access_token, the client uses access_token to send a request to the Resource Server. But as all we know, the expired time for a jwt is too short. And we do not require the users to pass their name and password once more! At this time, the refresh_token provides a vary convenient way that we can use to exchange a new access_token. The normal way may be as per the following. I will use ASP.NET Core 2.0 to show how to do this work. You need to install the SDK of .NET Core 2.0 preview and the VS 2017 preview. Creating an ASP.NET Core Web API project. Edit the Program class to specify the url when we visit the API. Add a private method in Startup class which configures the jwt authorization. There are some differences when we use the lower version of .NET Core SDK. And, we need to use this method in the ConfigureServices method. Do not forget touse the authentication in the Configure method. The last step of our Resource Server is to edit the ValueController so that we can use the authentication when we visit this API. How to design the authentication? Create a new ASP.NET Core project and a new controller named TokenController. Both above two scenarios only use one action , because the parameters are similar. When the grant_type is password ,we will create a refresh_token and store this refresh_token to the sqlite database. And return the jwt toekn to the client. When the grant_type is refresh_token ,we will expire or delete the old refresh_token which belongs to this client_id and store a new refresh_toekn to the sqlite database. And return the new jwt toekn to the client. I use a GUID as my refresh_token , because GUID is more easier to generate and manager , you can use a more complex value as the refresh token. At last , Create a console app to test the refresh token. We should pay attention to the request of the Resource Server! Now , using the dotnet CLI command to run our three projects. Here is the screenshot of the runninng result. In the console app, I do not store the access_token and the refresh_token, I just used them once . You should store them in your project ,such as the web app, you can store them in localstorage. When the access_token is expired , the client should remove the expired access_toekn and because the short time will cause the token expired , we do not need to worry about the leakage of the token ! This article introduced an easy way to handle the refresh_token when you use jwt. Hope this will help you to understand how to deal with the tokens.